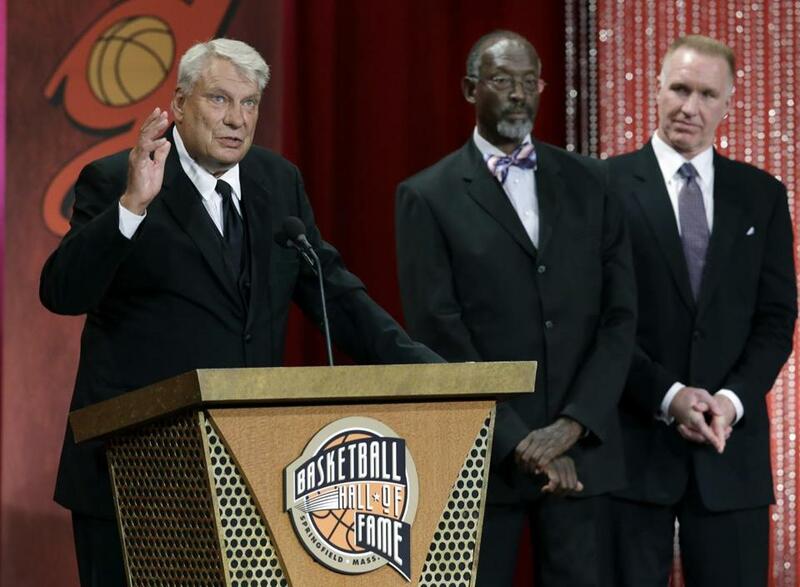 Don Nelson, left, spoke during the enshrinement ceremony for the 2012 class of the Naismith Memorial Basketball Hall of Fame as Satch Sanders and Chris Mullin listened at Symphony Hall in Springfield Friday. 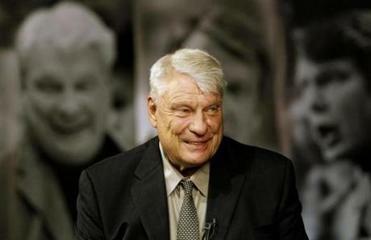 SPRINGFIELD — Don Nelson entered the Naismith Basketball Hall of Fame Friday night in a similar manner to which he became the winningest coach in NBA history. He picked moments to be serious, littered his speech with jokes, and even plugged his Maui coffee shop. It was a splendid speech, a rundown of a career filled with ups and downs, and a triumphant ending. One of 12 inductees in the Class of 2012, Nelson was unable to win an NBA championship as a coach, but he spent 35 years trying, and left the game having resurrected three franchises and been directly involved in a handful of Hall of Fame careers. Nelson’s theme since being named to the Hall has been one of good fortune. He was fortunate enough to land with the Lakers after a year with the Chicago Zephyrs, fortunate enough to receive a call from Red Auerbach after Tom Heinsohn retired to join the Celtics as a forward. Fortunate enough to last 11 years in Boston, retiring with five titles. Fortunate enough for his jumper to bounce high off the rim and through the net at the Forum to help give the Celtics a 108-106 Game 7 victory over the Lakers for another title in 1969. And he was fortunate enough to still be productive and therefore part of the post-Russell Celtics that won titles in 1974 and ‘76 with Dave Cowens and John Havlicek. The good fortune continued into his coaching career, a testament to the theory that a title does not necessarily make a man. Barry Switzer won a Super Bowl, Bud Grant did not. Jerry Sloan never won a title, so Nelson is in good company. The former Celtic spent 30-plus seasons as an NBA coach, winning three Coach of the Year awards and leading 18 of his teams to the postseason. Nelson’s career shouldn’t be defined by lack of a title but rather his impact on the game, loosening the grip of regimented offensive styles and making the game fun, turning the San Francisco Bay Area, never a professional basketball hotbed despite producing many NBA players, into a vogue location in the late 1980s with Run TMC. Nelson helped bring respectability to the Mavericks, who had been mostly downtrodden for their 16 years, and he was astute enough to hand over the coaching job to Avery Johnson, who brought Dallas to the cusp of a title in 2006. He also reinvigorated basketball in the Bay Area nearly 20 years after Run TMC, leading a new generation to an upset of the top-seeded Mavericks in the first round of the 2007 playoffs. Nelson’s Bucks teams were immensely talented, but they would run into the Celtics or 76ers, who took turns dominating the Eastern Conference. Nelson would have loved to take the Larry O’Brien Trophy to Hawaii, smoking a cigar while it basked in the sun. Instead, he will be content as a coach with 1,335 victories, 18 playoff appearances, three Coach of the Year awards, and many great memories. Nelson’s career should be celebrated and remembered for its success. A title as a coach would have served as icing on the cake, but it doesn’t define his career. Gary Washburn can be reached at gwashburn@globe.com. Follow him on Twitter at @gwashNBAGlobe.